PRS Announce the John Mayer Silver Sky! 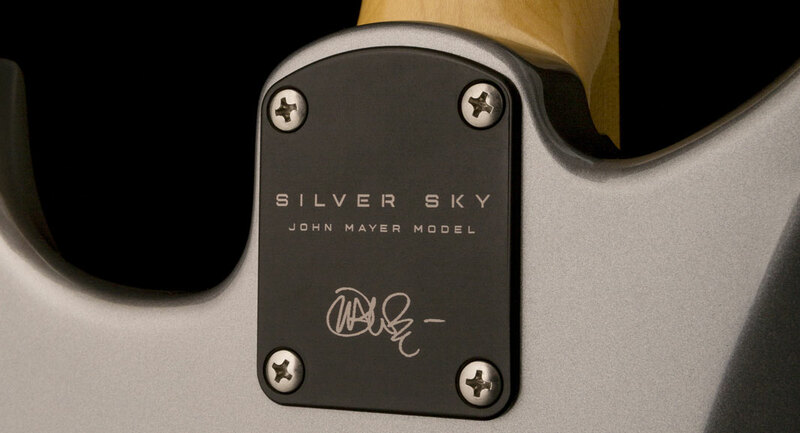 - Andertons Music Co.
PRS Announce the John Mayer Silver Sky! The Silver Sky is a collaboration between PRS and John Mayer - now with 8 stunning finishes to choose from! It's the guitar that's captivated both PRS devotees and eagle-eyed John Mayer fans, and now it's become a reality! The Silver Sky is the result of a close collaboration between Paul Reed Smith and Mayer, who wanted to combine trademark PRS build-quality and design with elements of his favourite vintage guitars. This incredible guitar features a near-total departure from the familiar PRS blueprint, including reconfigured electronics, a brand new neck shape, and of course, a completely redesigned aesthetic. Paul Reed Smith has been working with John Mayer for several years now; our first taste of their collaboration was the release of the ultra-luxurious Super Eagle Private Stock models. Stunning woods, world-class electronics and several highly-detailed performance tweaks resulted in one of PRS' most versatile (and exclusive) guitars to date. With the Silver Sky, however, it was back to the drawing board. This guitar has been designed from the ground up, taking influence from some of Mayer's most prized vintage guitars, his incredible playing ability, and his desire for something entirely new. Smith took these elements and tweaked them to the finest detail, with regular input from Mayer during the design process. Although many aspects of the Silver Sky were based on PRS core model designs, the tweaks were so comprehensive that many parts of the guitar bear the initials JM in the name. PRS are known for making some of the most beautiful guitars in the world. Their famed attention to detail and unparalleled build quality needs no introduction, and has cemented them as one of the most respected manufacturers in the industry. It's therefore no surprise that the Silver Sky is an instrument of the finest calibre, in true PRS style. Several appointments echo the designs of Mayer's unique '60s guitars that he's extensively toured over the years. These include the use of alder as the body wood, providing a brilliantly balanced tone that's rich and pronounced. The body shape was based on the PRS DC3 model, altered a number of times until it was perfect - it's worth noting that they've retained the signature PRS lower horn scoop for easy fret access. They've also employed a combination of maple and East Indian rosewood for the neck and fretboard respectively. This adds a brilliant sparkling sustain, while delivering a smooth resonance to the low-mids and bass frequencies, not to mention silky-smooth playability. You've got 22 PRS acoustic frets with a 25.5" scale length and a 7.25" fretboard radius, with the aptly-named 635JM profile. This is a truly vintage-style neck, while being unmistakably PRS! PRS enthusiasts will notice that their trademark headstock has been reversed on this model; this is due to Mayer's need to have extra access on the underside of the fretboard by the nut. By reversing the headstock, this access was made possible, while also being unique design feature to boot. The Silver Sky is triple-loaded with 635JM singlecoil pickups, carefully wired with Mayer's requirements in mind. The result is a colourful tone that could be described as 'round' or 'full', perhaps not what you might expect when seeing them for the first time. They also deliver a tamed, responsive high-end that is pronounced and clear without being intrusive. To control the pickup configuration, you've got a single volume knob, two tone controls and a 5-way blade pickup selector. Combine these controls with the 635JM and you have an extremely colourful tonal palette at your disposal. Have everything turned up full and select the neck pickup for a truly spanky stadium-worthy tone, or roll off the top end and use positions 2 or 4 for a poppy funk sound - the choice is yours. The nickel hardware has been carefully considered to maximise performance without compromising the slick aesthetic of the Silver Sky. The tuners are vintage-style with a closed-back design, but with the modern PRS locking mechanism. This means no worrying about restringing or tuning stability! The double-action truss rod is a popular PRS design appointment, used in many of their core line models. It ensures consistent neck stability and durability, whether it's a studio guitar or your go-to touring workhorse. They've also made sure that you can adjust the truss rod from the front of the headstock - a minor adjustment but one that makes life easier. The bridge incorporates a similar vintage design to the tuners but with a few modern PRS alterations. The tremolo arm is steel, with a small-set screw allowing adjustment - this prevents the arm from snapping off, as with some older tremolo-equipped guitars. The bridge uses Gen III knife-edge screws on the front plate to ensure that the bridge returns to pitch - this also allows a comfortable playing position. It's worth noting that the bridge plate rests on the body in neutral, meaning it can only be bent downwards. This adds to the resonance and projection of the guitar. All in all, the Silver Sky combines modern PRS build quality & versatility with the familiar elements of some of the most sought-after vintage guitars in the world. If it's good enough for Mayer, it's good enough for anyone. Shop the full PRS range now!